Activities for the siblings aged 8+ living with a child who has a disability or special need. Drop in session offering parent/carers a therapist, refreshments and chat. ACTION LEARNING CENTRE – for Special Educational Needs students. Action Learning is a farm based learning centre for Primary, Secondary and Special Educational Needs students. Also offering training for Adults who wish to learn or brush up on previously learnt skills. They provide an accredited alternative learning provision which is based in 10 acres of farmland in Downham, Essex. The centre also provides a holiday club and one off day visits. “We are pleased to say that the introduction of further trades in basic plumbing, bricklaying, electrics, plastering, tiling, and painting and decorating, have proved immensely popular with the students, who are are queuing up to gain or improve their skills. Do you have a disabled child aged 3 to 19 years? Are you looking for an out of school club? Somewhere they can have a fantastic time? As a registered charity we have been supporting families since 1982. We offer a wide range of opportunities for young people with disabilities . We do this through our holiday and out of school clubs with a range of fun activities within a happy safe and relaxed environment. We have a high staff ratio and are all highly qualified and CRB checked. Holiday clubs in Basildon, Clacton and Thundersley. If you are a young person aged 12-25 with learning disabilities / additional needs, we invite you to check out the wide range of social activities we offer. The new edition of InterAct’s Activity Programme is ready and waiting for you to browse! The new programme is full of exciting things to do in the new year. Just take a look and choose what to book! For 30 years Accuro have been enabling people to improve the quality of their lives by offering unrivalled services to children, young people and adults with a disability and their families, providing a range of services developed in response to specific, identified local needs. 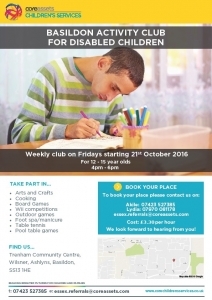 Saturday Play Club – Children 6-16 years of age with a disability living in the Uttlesford area. Loughton Youth Group – A youth group for 11-19 year olds with disabilities in the Loughton area. Weekly Club on Fridays for 12-15 year olds, from 4pm-6pm – Cost £3.30 per hour. At Trenham Community Centre, Wilsner, Ashlyns, Basildon, SS13 1HE. Essex Outdoors is Essex County Council’s Outdoor Education Service, delivering a range of high-quality and high-impact outdoor learning and adventurous activity courses. Weekend and half term activity opportunities including Archery, High Ropes, Aerial Runway etc for children and young people with disabilities. Just Ride runs regular drop-in inclusive cycling sessions for people of all ages and abilities. Hannah Lustig is a qualified dance teacher who is extremely passionate about the class and pupils she teaches. The class is designed to promote co-ordination, mobility and confidence, and is also good for social interaction and making new friends. Made up of natural dance movement, rhythmic fun with instruments and some tap dancing, it would suit someone who has danced before or a complete beginner. Anyone is welcome to come along and try the class free of charge, or even come along and watch. Please call Hannah on 07952 297859 or e-mail:hannahlustig@hotmail.com to find out more.